Pen and brown ink and wash, with white opaque watercolor, on paper prepared with a brown wash; partially incised with stylus and pricked for transfer. Inscribed on verso of lining, in pen and brown ink, "c[?] X / Delle[?] fec' Canonie / spallier". Purchased in London in 1954 by János Scholz, New York (no mark; see Lugt S. 2933b). While Gilbert’s act of deductive reasoning is convincing, the attribution has not been universally accepted. The primary difficulty arises from the lack of com- parable evidence, for there is only one other drawing generally accepted as Ber- gognone’s, a very different Assumption in Berlin.5 Moreover, Piera Giovanna Tordella argues that the Morgan and Ringling drawings should not even be considered the work of the same artist, much less aspects of the same project. She returns the Morgan drawing to Luini while identifying the Ringling drawing as generically “North Italian.” Tordella also rejects Gilbert’s identification of the subjects, although without suggesting real alternatives.6 This seems an overly critical approach. 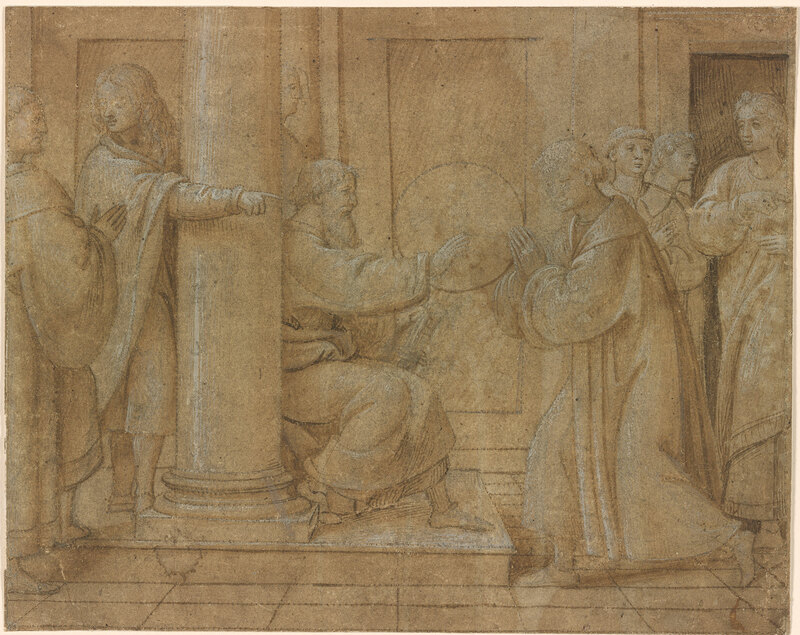 It remains difficult even to reconcile the Morgan sheet with Luini’s graphic work, given that even a generically similar work such as the Deposition, in the Louvre, is handled in a manner more reminiscent of Leonardo’s own hazy chalk drawings.7 Indeed, Giulio Bora later reiterated that the older attribution of the Morgan drawing to Luini cannot stand, although Bora still attributed the drawing to an anonymous master in Luini’s circle.8 This would not rule out Bergognone, who in the later phase of his career began hesitatingly to incorporate aspects of leonardismo in his work, perhaps logically finding the most palatable variety in the work of Luini, who shared Bergognone’s pictorial conservativism. Marani and Shell, in fact, talk about a Luinesque phase of late Bergognone, even citing the present drawing as an example.9 In the absence of other evidence, however, the Morgan and Ringling drawings perhaps remain best labeled as “attributed to Bergognone.” Although the sheets are entirely pricked for transfer, suggesting that they are cartoons used in the production of a painting (presumably, given its dimensions, in a predella), no corresponding work is known. Regardless of who created them, these sheets remain illustrative of the merging of fifteenth-century Lombard traditions with the new impetus that Leonardo brought to art in Milan. Bloomington and elsewhere 1958, no. 25. Compare, for example, the four predella panels representing the life of St. Ambrose (now in the Kunstmuseum, Basel; the Accademia Carrara, Bergamo; and the Galleria Sabauda, Turin; see Pavia 1998, nos. 28–30) or, even more compellingly, the predella with scenes from the life of St. Benedict (divided between the Castello Sforzesco, Milan; the Musée des Beaux-Arts, Nantes; and the Certosa in Pavia; see Pavia 1998, nos. 33–35). Kupferstichkabinett, Berlin, KdZ 5104. See Schulze Altcappenberg 1995, 106–8. Schulze Altcappenberg accepts, however, the attribution of the Morgan drawing to Bergognone. Pavia 1998, 399–413. Tordella also compares the drawings to underdrawings seen in infrared reflectograms of paintings, which are not reliable indicators of an artist’s style of making preparatory sketches on paper. Musée du Louvre, Paris, inv. rf 476. Rhoda Eitel-Porter and and John Marciari, Italian Renaissance Drawings at the Morgan Library & Museum, New York, 2019, no. 48. Selected references: Oakland and elsewhere 1956, no. 55; Ottino della Chiesa 1956, no. 29; Bloomington and elsewhere 1958, no. 25; Detroit 1960, no. 30; Staten Island 1961, no. 6; Cologne 1963-64, no. 89; New Haven 1964, no. 39; Gilbert 1968, 4-5; Courcelle and Courcelle 1969, 90; Washington and New York 1973- 74, no. 63; Scholz 1976, no. 21; Fellows Report 9 1981, 176; Marani 1987, no. 30; Bambach 1988, 229-30; Schulze Altcappenberg 1995, 108; Pavia 1998, 403-4; Bora 2000, 76n17. Gilbert, Creighton et al. Drawings of the Italian Renaissance from the Scholz Collection. Bloomington : Indiana University Art Center, 1958, no. 25, repr. Scholz 1963-64, no. 89 repr. Stampfle, Felice, and Jacob Bean. Drawings from New York collections. I: The Italian Renaissance. New York : Metropolitan Museum of Art : Pierpont Morgan Library, 1965, no. 46. Creighton Gilbert, "Two Composition Drawings by Bergognone," Master Drawings, VI, 1968, 3-20, repr. pl. 2 (includes previous bibliography and exhibitions). Oberhuber, Konrad, and Dean Walker. Sixteenth Century Italian Drawings From the Collection of János Scholz. Washington, D.C. : National Gallery of Art ; New York : Pierpont Morgan Library, 1973, no. 63, repr. Scholz, Janos. Italian Master Drawings, 1350-1800, from the János Scholz Collection. New York : Dover, 1976, no. 21, repr. Ryskamp, Charles, ed. Nineteenth Report to the Fellows of the Pierpont Morgan Library, 1978-1980. New York : Pierpont Morgan Library, 1981, p. 176-177.